Question:What gave the perps the confidence to use the scenario of 'terrorist attacks using four planes'? Answer:They have done it before. A number of years ago,well before I was aware of mass media deception,(thanks for helping me to open my eyes)I used to spend alot of time reading about the flights,crew,passengers,families of passengers etc,I was looking for answers,but just ended up confused and gave up.I managed to ignore my desire for the truth for a few years,but last year on YT I found September Clues,this forum,and The Vicsim Report.Now it makes sense no planes,no passengers and no passenger families no terrorists,just Sims and actors,so its no wonder I used to get no where.My point to this is,back when I used to read about the flights of 9/11,and I thought they were real,I would also read about the many other air disasters in and around the USA,that happened in the years leading up too 2001,I would make comparisons and try to find similarities with the 9/11 flights,(at the time I figured terrorists had also downed these flights,and the government was covering it up)now that I know the truth,I figured that perhaps these earlier disasters were similar because they were simulations, practice for the main event.I feel that by identifying events pre 9/11 that the perps could of used to develop their skills,test their theories,and test public reaction,we may uncover more mistakes that they have made. An example of one of these earlier possible sim disasters is Swissair Flight 111. Anomalies with communications and radar. The aircraft disintegrated on impact. Despite there been a memorial,and full passenger list,with background stories,friends and families etc,it is VERY difficult to confirm these details. I conclude that,the passengers on this flight were vicsims,perps,and nonexistent. However I would like to prove this(at least to myself),and my problem is,I am a absolute NOVICE researcher,especially when it comes to Vicsims,can anyone give me some advice on how to best approach this type of research? EDITED To add a link. wtc-wtf wrote: Question:What gave the perps the confidence to use the scenario of 'terrorist attacks using four planes'? Unfortunatelly we are limited by BTS to 1996 as a least recent year . Last edited by whatsgoingon on Fri May 24, 2013 9:13 am, edited 1 time in total. Guys,thanks for this advice,bts.gov is excellent,I will try to find a similar database to check the international flights. Lots of fishy flights and many stories have traces of conspiracy in them (hints of terrorism, explosives, and the like.) Overall I would say you are onto something. Lots of fake plane wrecks but I have not looked into it at all. I hadn't even considered post 9/11 flights,this flight AA587 is very interesting to me. wtc-wtf wrote: Guys,thanks for this advice,bts.gov is excellent,I will try to find a similar database to check the international flights. There was a lot wrong with my study, but I was only cutting my teeth on this stuff! Maybe this belongs in another thread too! Sorry! - 911 emergency ambulance worker reported to have died at age 24 in the stairwells of the WTC while rescuing people. The call for help went out and emergency medical technician Yamel Merino, 24, responded, becoming one of the first rescue workers to enter the burning World Trade Center. "She worked any time, anywhere," said Al Kim, director of MetroCare Ambulance Group. "She was the first wave. She was ready to go." Kim said Merino's energy helped her rise through the company's ranks of about 2,000 workers, advancing over five years from nonemergency transports to the 911 unit. That dedication, and what Kim called a "magnetic personality," won Merino honors among her peers: She was named MetroCare's EMT of the year last year. Yet her dedication also brought her to a stairwell of the World Trade Center on the morning of the attacks, where she was helping the injured and the exhausted when the tower collapsed. Merino, who was buried Friday, is survived by her 8-year-old son, Kevin Villa; her mother, Anna Jager; her father, Fernando Merino; brothers Bryant and Leslie Jager; and sisters Gabriella Sierra and Vianca Jager. Huh? Yamel had a sister named "Vianca Jager"? Uh, let's see....what springs to mind? 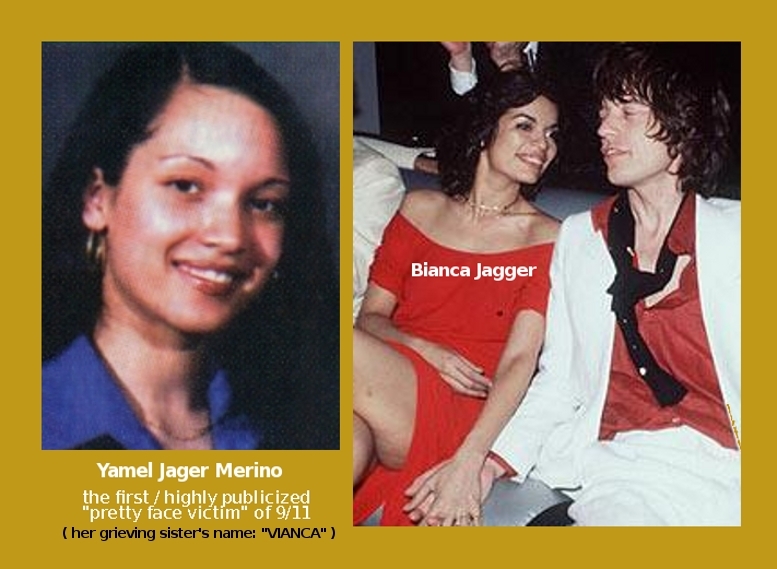 (In the below picture duo, I've flipped (mirrored) Yamel's portrait horizontally - so as to match the face angle/ perspective of young Bianca and facilitate the visual comparison. 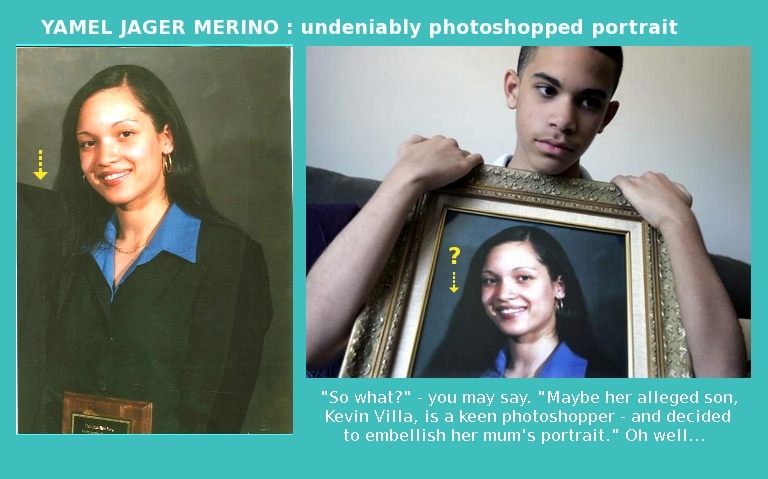 Ok, so go ahead: call me an "image manipulator"! 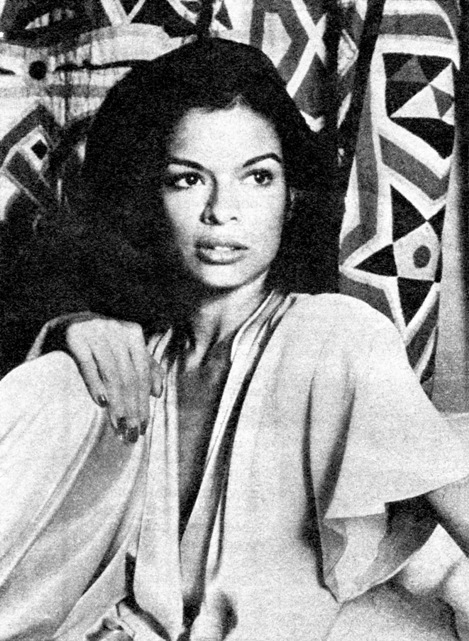 Bianca Jagger (born Bianca Pérez-Mora Macias, May 2, 1945) is a Nicaraguan-born social and human rights advocate and a former actress and model. Jagger currently serves as a Council of Europe Goodwill Ambassador, Founder and Chair of the Bianca Jagger Human Rights Foundation, Member of the Executive Director's Leadership Council of Amnesty International USA, and a Trustee of the Amazon Charitable Trust. Over the past thirty years she has written articles and opinion pieces, delivered keynote speeches at conferences and events throughout the world and participated in numerous television and radio debates, about numerous issues including genocide, the war in Iraq, the war in Afghanistan, the war on terror, war crimes against humanity, crimes against future generations, the Former Yugoslavia, Sri Lanka, Central America, Iran, Iraq, India, children and women’s rights, the rights of indigenous peoples, climate change, the rainforest, renewable energy, corporate social responsibility, the ensuing erosion of civil liberties and human rights, and the death penalty. So, Merino is a breed of sheep. Good. I then tried to find a definition of "Yamel" on WORD_A-Z.com. No results for Yamel were found - but "similar results" yielded: Cyamelide: "A white amorphous substance, regarded as a polymeric modification of isocyanic acid. Also, wickedpedia says of Cyamelide : " A porcelain-like white substance which is absolutely insoluble in water." Dang - what a wacky conspiracy theorist I am! Good work on Ms. Merino! 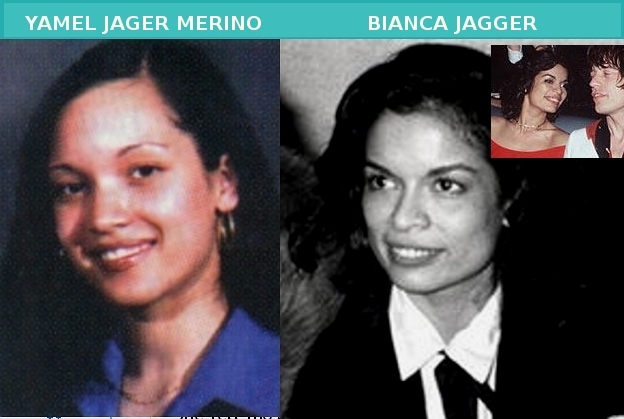 She seems to have nose, teeth, and lips identical to Bianca. Sharp eyes and mind, sir! SoCal fellow wrote: Good work on Ms. Merino! 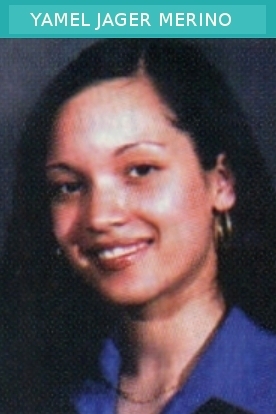 She seems to have nose, teeth, and lips identical to Bianca. Very nice, tieing the similarity in the name to the similarity in appearance. Nice neck join there! Great find! simonshack wrote: "YAMEL JAGER MERINO"